Sudan and South Sudan agreed Tuesday to extend an oil deal between the two countries, officials said, but they failed to settle the exact terms. But a fall in global oil prices meant that the fee exceeded Juba’s earnings from oil sales, so the impoverished South lost money on every barrel sold. 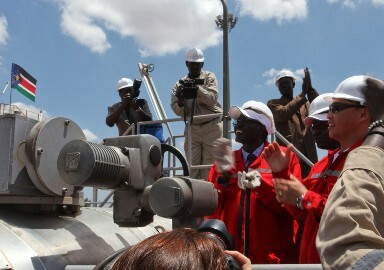 The countries’ oil ministers began talks in Khartoum on Sunday as South Sudan’s new Vice President Taban Deng Gai began a two-day visit aimed at addressing issues outstanding from the 2011 split. “Both sides broadly agreed on extending the existing oil agreement which expires before the end of this year,” a joint statement said on Tuesday. During the discussions held this week, South Sudan agreed to increase its oil production and revive oilfields in the country’s Unity state. South Sudan is estimated to produce around 150,000 barrels of oil a day — down from 350,000 at independence in 2011.